Packaging ready-made baking mixes in jars for gifts isn’t a new idea by any means and over the years I’ve done my share of fancy mixes. This year I’m going back to a classic though-a fantastic solidly awesome Chocolate Chip Cookie mix in a jar recipe! 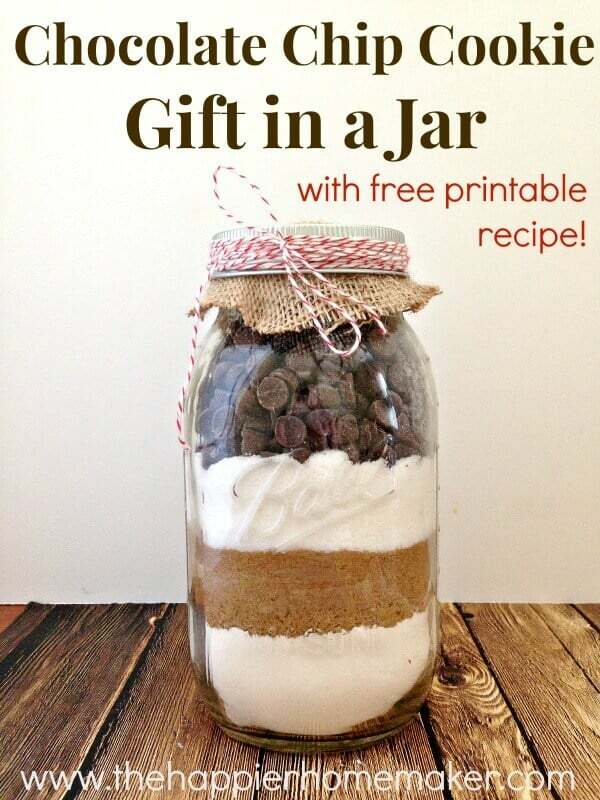 This is my very favorite recipe for chocolate chip cookies in a jar ready to be baked by the lucky recipient! I also have a few tips for making your mixes look Pinterest-perfect as well as a free printable recipe tag! Combine flour, baking soda, and salt in small bowl. Place mixture in 1-quart jar. 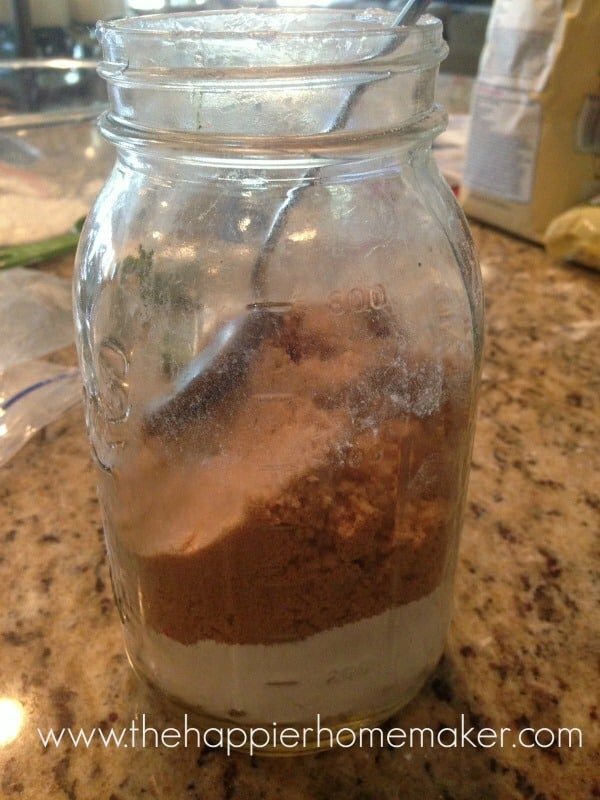 Now for the tip to getting your mix to look “pretty,” use the back of a spoon to pack the flour mixture down around the outside of the jar. Add the brown sugar next using the same method to pack it down in the jar. Finish by adding the sugar and top with the chocolate chips. 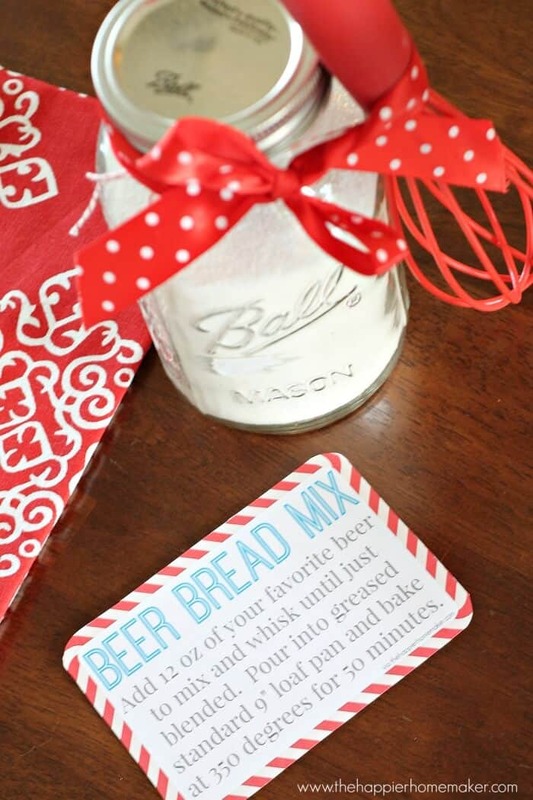 Include this printable with your gift so the recipient knows how to use the mix! 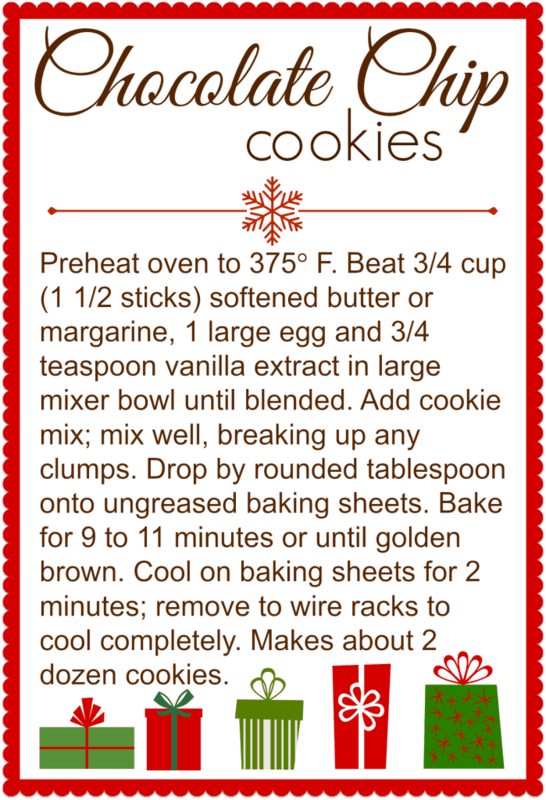 If you click here or the image below you can download a pdf with four recipe printables per page. 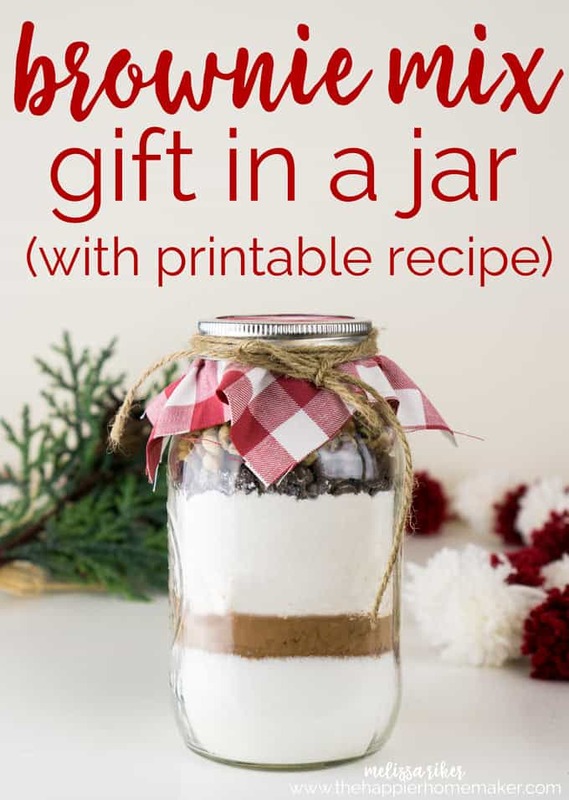 I hope you enjoy this quick and easy Cookie Mix in a jar DIY Christmas gift! I’ll be back tomorrow with a fun and easy DIY decor project! Is this a wide mouth or regular mouth jar? Thank you! I used a wide mouth jar because it’s easier to add the ingredients and push down. Didn’t find it that great. Mixed ingredients like recipe said, but ended up with just a bowl full of dry ingredients with very little moisture. Did not mix well at all. Throwing it away and doing it the old fashioned way.–From scratch. Did you add the butter, egg and vanilla to the dry ingredients? I would love to make this for gifts! I know some countries use different quantities for 1 cup. Please can you tell me how many ml or grams you use in 1 cup? I wouldn’t want too few ingredients, or too much and affect the way the jar looks and how they bake. Thank you! How long can you keep these? Can I make them this fall and keep them through the new year? We don’t have chocolate chips in our country so does it matter if I put in chopped chocolate instead ? Thank you so much for making my life easier and cuter! I love the printable recipe and can’t wait to give these and try them out for myself as well. So CUTE! Did this last year for my daycare families and I’m doing it again this year because it was s HUGE hit! You are not to believe this! My daughter and I made these for a craft fair 16 (yes!, 16!) Year’s ago. Last week I found a jar that I had misplaced in a move. After smelling and eye-ing it I decided to try baking them, and they were great!, still eating them. I can only guess that it was packed so tight, no oxygen could get in to spoil it. Called my daughter and told her—-she still doesn’t believe me! Hi Melisa, I got gift jar from my very good mom friend. what a great gift idea! I gave all these as Christmas gift 2017 and everyone loved it. I was also asked how come “mom” gave me her cookie recipe and not my other siblings. 😆. I said it was you . Do you know how I would modify this for high altitude? I am at 5,280 ft. Thanks! Greetings! I am having kids make these for a middle-school math class project! I am going to have the kids decide how to scale the recipe down to an “individual portion,” and I will give each team four smaller jars t fill so they can all take some home. Do you know approximately how many cookies one batch makes? 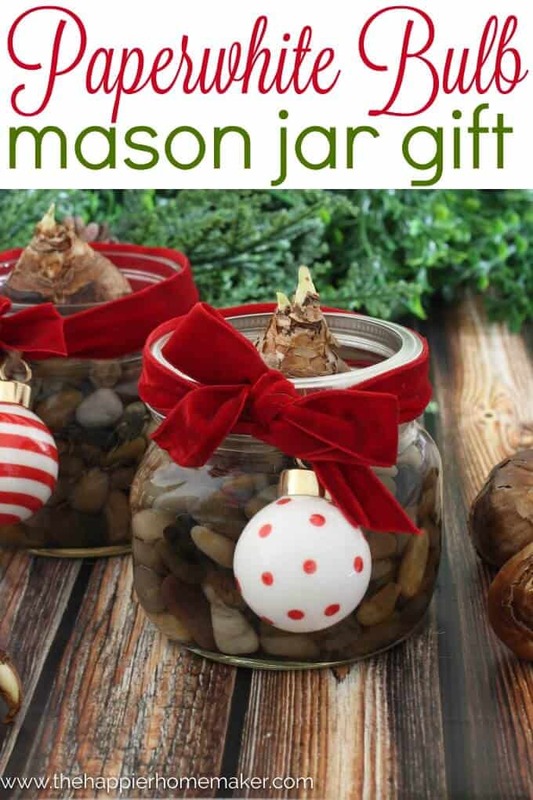 I want to make sure I give them enough ingredients to make at least four to six cookies per tiny jar :). Oops! I’m sorry! It says two dozen on the printable directions! I bet it is overwhelming to post a great little recipe and have everyone ask so many questions! This seemed to have too much butter or not enough flour. Cookies were flat and greasy. Glad we made them before filling jars. best cookie recipe ever! I make these all the time! 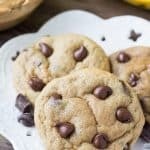 Would this recipe work the same if I substituted 3/4 cup of the flour for 3/4 cups of oatmeal? Bless you for including a printable recipe card! Just made these as Christmas gifts for my family and it was so nice to print the cards straight from my phone. Thank you!